One of the most sought after buildings on the Upper West Side, Mayfair Towers is ideally located just steps from Central Park on the prestigious West 72nd Street block. 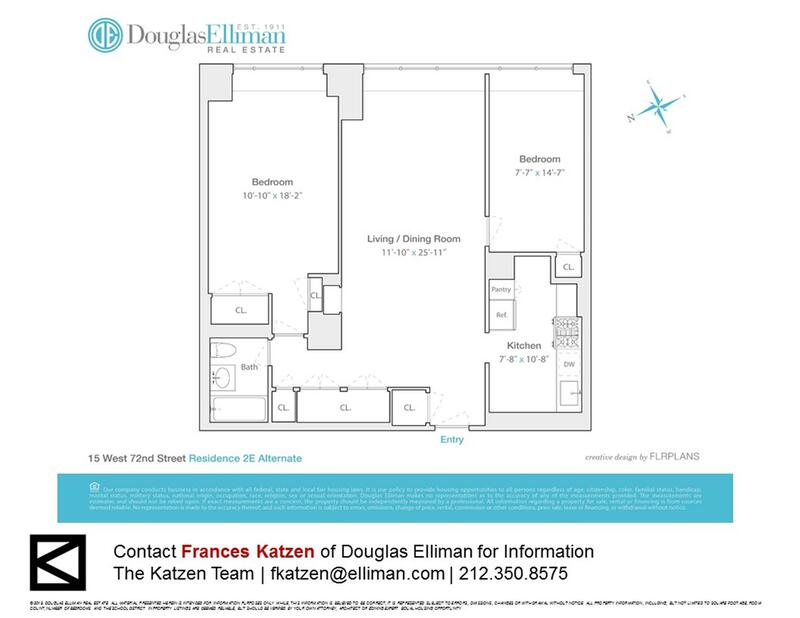 Residence 2E offers an expansive 1-bedroom layout, which may easily accommodate a second bedroom, home office or den. Designed to embrace an open living experience that effortlessly integrates the spacious living room and dining room ? featuring a wall of over-sized windows overlooking the private courtyard to the east, and quintessential brownstone homes of the tree-lined 73rd Street to the north - with the well appointed eat-in kitchen offering stainless steel appliances, oak cabinetry and granite countertops. Brand new custom built-in shelving and fully outfitted closets throughout the entire apartment provide ample storage space, alongside brand new automatic and duel control lighting. The peaceful king-size master bedroom offers an abundance of livable space for additional furniture, oversized windows that fill the room with natural light complimented by brand new window treatments and custom millwork to outfit the stand alone AC/Heating unit. The bathroom is conveniently located just off of the bedroom, and adjacent to a wall of deep-set closets, which can accommodate a Washer/ Dryer as well. An extraordinary roof terrace features breathtaking unobstructed views of Central Park to the east, and the Hudson Riverto the west. The full-service building amenities also include a 24-hour doorman and concierge, live-in super, fitness center, parking garage with valet, suitcase storage, bike room, on-site dry-cleaning and tailor with additional washers and dryers on every floor, courtyard, and children's outdoor play area. Pied-a-terres and pets are welcome. Flip tax - $3 per share or .75% of the sale price, whichever is greater.